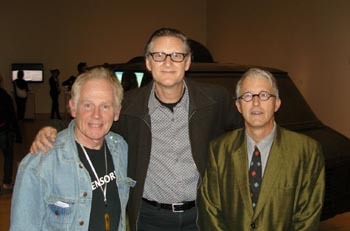 UCSC professor of Film and Digital Media Chip Lord (right), shown with two former members of the legendary Ant Farm architecture collective he co-founded, (from left) Curtis Schreier and Bruce Tomb. The trio currently have an art installation on display at the San Francisco Museum of Modern Art running through Feb. 8. As part of the modernization and remodeling of the airport's Bradley International Terminal, the city is installing two video walls in the "meet and greet" area for arriving passengers from international flights. Each wall will have 25 flat screens in a grid that can be programmed to present moving images in multiple ways. The art works created by each of the 20 commissioned artists will play in a continuous rotation-free of any commercial content. Lord said he will incorporate images for the project that he has been collecting for the past several years. Titled "To and From LAX," his piece will offer a portrait of the global infrastructure of air travel through the use of photos and videos that have been shot in public spaces at more than 25 airports, as well as inflight. "The work is in the tradition of documentary photographers such as Walker Evans and Robert Frank, whose work has been exhibited in galleries and museums, and suggests a melding of the boundaries between documentary and fine arts photography," said Lord. Lord is now busy gathering images and video footage and hopes to begin editing this spring. He expects to complete his project in fall 2009, and the installation is scheduled to open to the public in 2010. "The artists will be assisted by LAX technical staff in the final stage of post-production," Lord added. "This has to do with programming the delivery of footage to the 25-screen matrix-which is a device that radically expands the possibilities of conventional film delivery." Lord currently has an art installation on display at the San Francisco Museum of Modern Art, in collaboration with two former members of the legendary Ant Farm architecture collective he co-founded-Bruce Tomb and Curtis Schreier. The work is part of an exhibition called The Art of Participation: 1950-Now. Titled "Media Van v.08," the piece is a media sculpture that invites viewers to access a DVD showing vintage black and white video from 1970-as well as contribute to an ever-growing data bank by donating a file or image into the van's "Media Huqquh," a hookah-shaped digital time capsule to be opened in 2030. When visitors to the van sculpture at SFMOMA donate a file by plugging their hand-held digital device (camera, iPod, MP3 player, iPhone, memory stick) into the "Huqquh," the images will be displayed live in the gallery. The contents of the time capsule will continue to grow until the week before the exhibit ends. "The project is a rethinking of the 1971 Ant Farm Media van, which we toured the country in, shooting video with the first-generation Sony portapak," said Lord. "We found the original van in the Santa Cruz mountains, but we decided that in 2008 it should be a post-internal combustion vehicle, so the engine and drive train were removed." "We are showing vintage video from the 1971 Ant Farm Truckstop Tour and also collecting files for the year 2030, so the project has a time span of 60 years," Lord added. Lord noted that the artists will host a "closing and sealing" event at SFMOMA on Jan. 29 at 7 p.m., after which the contents of the time capsule will be exhibited as a slide show until the exhibition closes on Feb. 8, 2009. The Media van will then travel to Nantes, France, where it will be exhibited and a second time capsule will be created as part of the 2009 Estuarie Biennale, a contemporary art exhibition that takes place every two years along the Loire estuary.